Born and raised in Honolulu, Chris took his first restaurant job the summer before leaving for college and was instantly hooked. He spent the next four years dreaming about life in the kitchen, neglecting his studies and cooking lavish meals for his roommates. Upon graduation, Chris begged his way into Henry Adaniya’s legendary Evanston restaurant Trio, where a 27 year-old chef named Grant Achatz was about to commence the restaurant’s third iteration and, in the process, help transform dining in America. After Chicago, life’s tours and detours would eventually take Chris to kitchens as far afield as New York (Cru), France (Aux Vieux Four), California (The French Laundry), and Copenhagen as well as back home to Honolulu (Chef Mavro, Town). Throughout his career Chris has come to understand cooking as a transformative act, with the simple yet generous idea of feeding someone having the potential to profoundly affect a person’s mood, day or even life. 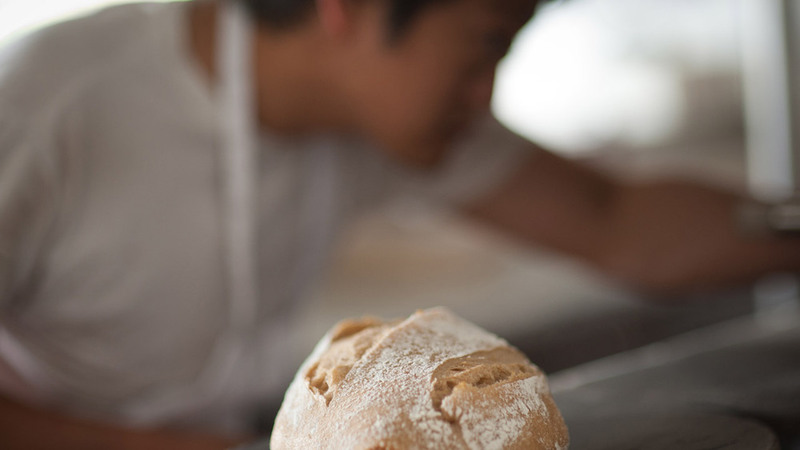 Bread, beginning with simply flour, water, and salt and resulting in a burnished product that speaks deeply to our most primal centers, is perhaps the most transformative of all foods and thus, he hopes, has the greatest potential to make the largest impact upon our culture. Chris holds a Bachelor of Arts degree in English Literature from the University of Chicago.